Shrink Pic is a Free Picture Resizing Tool that allows you to (Shrink Pictures) and Resize Pictures. Most pictures taken with digital cameras are too large in both capacity and image dimensions to send via email or post on a website, blog or forum. With Shrink Pic, you can shrink and resize your photos via a drag and drop process. This tool can take JPG, BMP, PNG, TIF, and GIF images and export them as JPG, BMP or PNG image files. 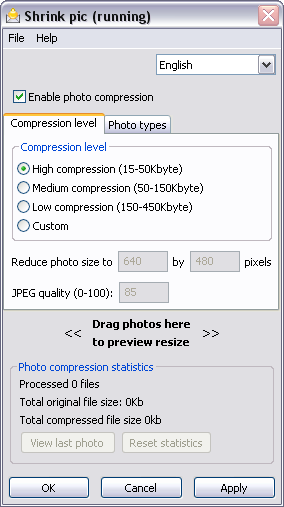 Adjustable Compression levels allow you to create pictures ranging from 15KB to 450KB in capacity. Shrink Pic comes with it’s own tool to allow you to copy the installation to a Flash Drive.